‘Thy kingdom come’ expresses our need for Jesus to be with us, pope said in audience. Pope Francis heard the confession of a priest March 7 at Rome’s Basilica of St. John Lateran. 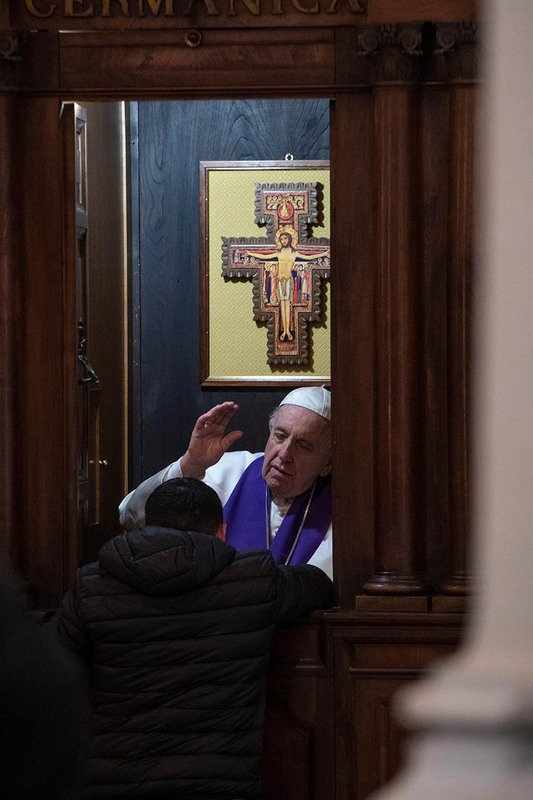 The pope administered the sacrament to several priests during his annual Lenten meeting with the priests of the Diocese of Rome. When we pray the “Our Father,” the second request we address to God is “Thy kingdom come” (Matthew 6:10). After praying for the sanctification of His name, the believer expresses the desire that His Kingdom may come soon. This desire poured forth, so to speak, from the very heart of Christ who began preaching in Galilee by proclaiming: “The time is fulfilled, and the kingdom of God is at hand; repent, and believe in the Gospel” (Mark 1:15). These words are in no way a threat. On the contrary, they are a blessed proclamation, a joyful message. Jesus does not want to press people to convert by sowing fear of God’s imminent judgment or a sense of guilt for the wrongdoing committed. Jesus does not proselytize: He simply proclaims. Rather, what He brings is the Good News of salvation, and, starting from this, He calls us to convert. Each of us is invited to believe in the “Gospel”: God’s authority is brought close to His children. This is the Gospel: The authority of God drawn near to His children. And Jesus announces this marvelous thing, this grace: God, the Father, loves us, is close to us and teaches us to walk on the path of holiness. The signs of the coming of this Kingdom are multiple, all of them positive. Jesus begins His ministry by caring for the sick, both in body and in spirit, for those who were socially excluded — lepers, for example — and sinners who were looked upon with scorn by everyone, even by those who were greater sinners than them but who pretended to be just. And what does Jesus call them? “Hypocrites.” Jesus Himself indicates these signs, the signs of the Kingdom of God: “The blind receive their sight and the lame walk, lepers are cleansed and the deaf hear, and the dead are raised up, and the poor have good news preached to them” (Matthew 11:5). We sometimes ask ourselves: Why is this Kingdom so slow to come about? Jesus likes to speak of His victory in terms of parables. For example, He says that the Kingdom of God is similar to a field where weeds and good wheat grow together: The biggest mistake would be to immediately intervene, by uprooting from the world what appear to us to be invasive weeds. God is not like us. God is patient. It is not through violence that the Kingdom is established in the world: Meekness is its means of propagation (Matthew 13:24-30). The Kingdom of God is certainly a great strength, the greatest one there is, but not according to worldly criteria. This is why it never appears to have the absolute majority. It is like leaven that is kneaded with flour: It apparently disappears and yet, it is what makes the dough rise (Matthew 13:33). Or it is like a mustard seed, so small, almost invisible, which, however, carries within it nature’s most explosive force, and once fully grown, it becomes the largest tree in the garden (Matthew 13:31-32). In this “destiny” of the Kingdom of God, we can sense the tenor of Jesus’ life. He too was a frail sign to His contemporaries, an almost unknown event to the official historians of the time. He described Himself as a “grain of wheat” that dies in the earth, but only in this way can it bear “much fruit” (John 12:24). The symbol of the seed is eloquent. One day a farmer plants it in the earth (a gesture which resembles a burial), and then, if he “should sleep and rise night and day, and the seed should sprout and grow, he knows not how” (Mark 4:27). A seed that sprouts is more the work of God than of the man who planted it (Mark 4:27). God always precedes us. God always surprises. Thanks to Him, the night of Good Friday is followed by the dawn of the Resurrection, able to illuminate the entire world with hope. “Thy kingdom come!” Let us sow this word in the midst of our sins and our shortcomings. Let us give it to the people defeated and bent by life, to those who have tasted hatred more than love, those who have lived aimless days without ever understanding why. Let us give it to those who have fought for justice, to all the martyrs in history, to those who have come to the conclusion that they have fought for nothing and that in this world evil always dominates. We will then feel the prayer of the “Our Father” respond. It will repeat those words of hope for the umpteenth time, the same words with which the Spirit sealed all the Sacred Scriptures: “Yes, I am coming soon”: This is the Lord’s reply: “I am coming soon.” Amen. And the Lord’s Church responds: “Come, Lord, Jesus” (Acts 2:20). “Thy kingdom come” is like saying “Come Lord Jesus.” And Jesus says: “I am coming soon.” And Jesus comes, in His way, but every day. We have trust in this. And when we pray the “Our Father,” we always say: “Thy kingdom come,” in order to feel Him say in our heart: “Yes, yes, I am coming and I am coming soon.” Thank you!